A beautiful table is just as important for a magical Christmas dinner as the delicious food, festive cheer and bad jumpers. Laying the table correctly for a formal dinner can seem like a daunting task, however by following a few simple guidelines you’re sure to impress your guests, even the Hyacinth Bucket (pronounced Bouquet!) of the family. Before the cutlery and dinnerware is set out, the table needs to be dressed. 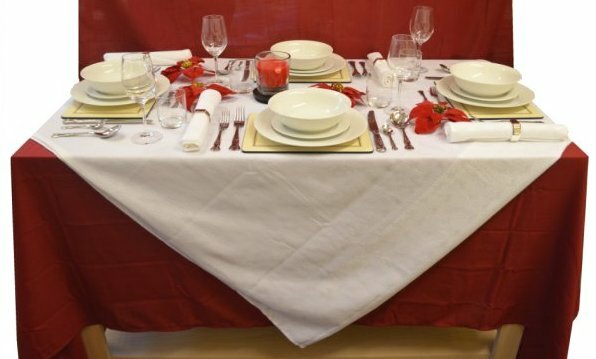 The tablecloth is the first thing to lay upon the table; a single tablecloth can be used or two co-ordinating tablecloths can be placed at alternating angles, usually the base cloth will be the larger of the two and will run along the table with the top cloth being running across the table so that its corners drape over the edges. A table runner can be placed along the table and will overhang at the two ends only, the table cloth and runner will give colour and decoration but also protect your furniture. Placemats and coasters can also be placed on the table for additional decoration and protection. Traditionally, placemats should be placed ½” from the edge of the table. Cutlery is arranged in the order that it will be used, starting from the outside. Knives and spoons are placed on the right of each plate setting; starting with a soup spoon, then a teaspoon and lastly a dinner knife closest to the plate. Forks are placed on the left of the plate, with a salad fork on the outside and a dinner fork closest to the plate. Forks are placed with the tines facing upwards and knife blades should face towards the plate. The dessert spoon and fork is placed above the plate setting with the fork closest to the plate and pointing to the left, the dessert spoon is placed above the fork with its handle pointing to the right. The cutlery should be placed neatly and spaced evenly, traditionally cutlery should be placed so that the end of handles are in line with the rim of the dinner plate, which in turn should be set 1” from the table edge. Dinnerware can be laid out before the meal, however it should be removed from the table before serving and brought to the table with each course. 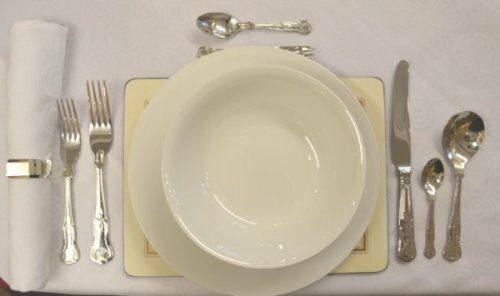 The formal setting would typically see a side plate placed upon a dinner plate, and if soup is being served the soup bowl would sit upon the side plate. A bread and butter plate is placed above and to the left of the dinner plate, with a butter knife placed across the plate with its blade facing inwards. A folded or ringed napkin is placed to the left of each place setting. If the napkin has been folded into a shape, it is placed in the centre of the side plate. Glassware should be set out to the upper right of the dinnerware. A water glass is placed above the point of the dinner knife, with a white wine glass to its right and a red wine glass is placed top centre of the two. A champagne flute can be set behind the wine glasses, if champagne is being served. 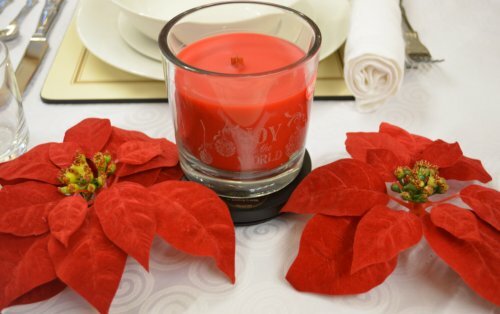 The Christmas dinner table would not be complete without a spectacular centrepiece, let your creative side out and add a flourishing floral arrangement or a colour candle display to the table, seasonal décor can be placed to complement the centerpiece and the table to add to the joy and cheer that we all love at this time of year. Why not try something different and fill a tall glass vase with baubles, or take a more traditional approach and make some decorative candle displays to place along the table. It is important to place centerpieces, flowers and candles so that they do not block eye contact to ensure an enchanting dinner, although strategically placing something between you and the mother-in-law can be just as enchanting! Christmas Dinner, Christmas Table, Dinnerware, Glassware, Placemats and Coasters, Tablecloths. Bookmark.